Legendary US linguistics professor and political critic Noam Chomsky called on the Palestinians to uphold their rights and never give up hope to restore them despite all odds and colonial plots being hatched against them. Chomsky made his remarks on Sunday in a lecture he delivered on the second day of the international conference on languages and literature at the Islamic university in Gaza. The American professor also stated that the western powers see the Palestinians as people with no rights because the Palestinians do not have resources or influence to give to them, so relying on such powers to get their rights and liberate their land is useless. He also hailed the Arab nations for revolting against their tyrants and said their uprisings reflected their desire for freedom and liberation from repressive regimes serving the interests of western colonial powers at their expense. 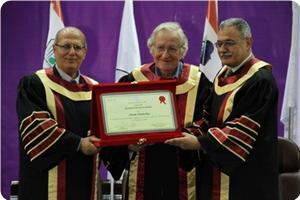 Chomsky was awarded an honorary doctorate degree by the Islamic university in Gaza in appreciation of his positions in support of the Palestinian cause. In a related context, Palestinian premier Ismail Haneyya met with US professor Noam Chomsky in his cabinet office and talked with him about a number of issues in the Palestinian arena. Haneyya hailed Chomsky for his courageous positions in support of the Palestinian people and their rights and honored him for his great efforts. Two Palestinian resistance fighters were killed on Monday in the Israeli aerial raid that targeted their position to the north of the Gaza Strip, medical and resistance sources said. Dr. Ashraf Al-Qudra, a spokesman for the health ministry, said that Abdulrahman Abu Jalala and Yasser Al-Tarabin were killed in the raid. Medical sources said that five other citizens were wounded in the raid that targeted a group of citizens near a school in the northern Gaza Strip city of Beit Hanun. The Qassam Brigades, the armed wing of Hamas, said that one of its Mujahideen was killed in the raid identifying him as Abdulrahman Abu Jalala. The Nasser Salahuddin Brigades, the armed wing of the Popular Resistance Committees, said that one of its field commanders, Yasser Al-Tarabin, was killed in the same raid. Meanwhile, Israeli media reported that a number of Palestinian rockets fell in the western Negev and near Askalan without causing any damage. For its part, Quds Press said that the Palestinian resistance fired mortar shells at the Israeli occupation forces that advanced into eastern Beit Hanun. Four Palestinian citizens were wounded on Monday in an Israeli air raid on Beit Lahia to the north of the Gaza Strip, medical sources said. Dr. Ashraf Al-Qudra, spokesman for the health ministry, said that Israeli warplanes targeted a position for the Qassam Brigades in northern Gaza injuring four citizens. He said that the casualties were taken to hospital. Israeli occupation forces (IOF) had advanced into the eastern area of Beit Hanun, to the north of Gaza Strip, on Monday morning in 14 armored vehicles. Local sources told the PIC reporter that the soldiers bulldozed a number of locations in the area as tanks and army choppers randomly fired projectiles to provide cover for the raiding troops. In an act violating international maritime law, Israeli naval forces boarded a humanitarian aid ship, the SV Estelle, that was en route to the Gaza Strip bringing humanitarian aid supplies including musical instruments and building materials. These are among the thousands of items still banned by Israeli forces from entering Gaza. The SV Estelle, which bears the flag of Finland, was guided into the Israeli port of Ashdod (formerly known as the Palestinian town Isdud before the Israeli takeover and expulsion of the indigenous inhabitants in 1948). The 30 passengers and crew, which include a former Canadian parliament member and several former members of the Israeli military who have since renounced the Israeli occupation of Palestine, have all been taken into custody by the Israeli military. Israeli Prime Minister Binyamin Netanyahu issued a statement praising the Israeli navy for intercepting the ship, saying that the aim of the humanitarian aid activists was to 'delegitimize Israel', and claiming that 'there is no humanitarian crisis in Gaza'. The attack on the international aid ship comes just days after a leaked document from the Israeli government revealed that Israeli officials had calculated the amount of food necessary to hold every Gazan man, woman and child to a 1200 calorie 'diet', and allowing just that amount of food to trickle into the besieged coastal Strip. This kind of calorie count and collective punishment of a population is a direct violation of the Fourth Geneva Convention, to which Israel is a signatory. In addition, just two weeks ago the United Nations issued a report stating that the humanitarian crisis in Gaza is so severe that the entire Strip will be uninhabitable in less than 15 years. Currently, two thirds of the population of Gaza depend on United Nations food aid for survival. Imports and exports of goods and services to and from the Gaza Strip were brought to a grinding halt in 2006 when Israel imposed its ground, sea and air blockade of Gaza. The Israeli airforce had previously bombarded and demolished the newly-constructed Gaza international airport, and have since tightly controlled the airspace over Gaza. 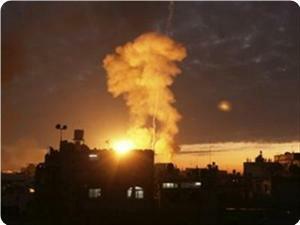 The only air traffic allowed is the Israeli airforce missions to bombard the residents of the Gaza Strip. Eva Manly, the wife of former Canadian legislator and ship passenger James Manly told the Associated Press, "It's hard to imagine what threat one sailboat, loaded with humanitarian supplies and a small number of people, could do to Israel's military". A spokesperson for the Hamas party in Gaza called the Israeli seizure of the ship an act of piracy. The Canadian Boat To Gaza reported that they received a message from the Finnish Foreign Department informing that Israel informed them that its soldiers will board Estelle solidarity ship currently around 120 Nautical Miles away from the Gaza shore. The Estelle ship is sailing under a Finnish flag; its crew was informed that the army will board the ship in international waters, and will tow the ship along with the activists to the Ashdod Port. Activists on-board the ship said that if the Israeli army attacks them, the attack will be another act of piracy and kidnapping to enforce the illegal Israeli siege and blockade on the coastal region. Irene McInnis of the Canadian Boat to Gaza stated that the ship is challenging the illegal and inhuman siege imposed on the coastal region, and added that “the world should not be silent anymore”. It is worth mentioning that retired Canadian Member of Parliament (MP) is on board the Estelle solidarity ship. A recent tweet from the ship says; "The crew reports that it is dark and still calm, but there are unidentified boats moving around them. We wish for peace and justice", the Ship to Gaza Sweden Ship to Gaza Sweden @ShiptoGazaSE said on its twitter account. Last Sunday, Israel issued a warning informing Finland that its army will intercept and stop the Estelle solidarity ship heading to the Gaza Strip to deliver humanitarian supplies. Israeli occupation forces (IOF) prevented a group of Palestinian farmers from reaching their land in Orta village, south east of Nablus, to harvest their olive crops, local sources said. Eyewitnesses said that the farmers had obtained permits to reach their fields near the segregation wall surrounding Etamar settlement, yet the soldiers blocked their way and beat them up. 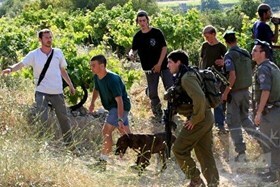 The farmers were also blocked yesterday from entering their fields and were attacked by Jewish settlers. The Nablus villages have been under constant attacks over the past few days at the hands of Jewish settlers to block farmers from reaping olives. The attacks included assaulting farmers, burning or damaging their olive trees, and robbing the crops. Residents of Ein al-Baid in the northern Jordan valley said that new expansion work is being carried out in Makhoula which is built on their land. Local sources said that the settlers have started building new structures to the west of the settlement after confiscating tracts of land at an earlier stage. The sources said that the settlement have been witnessing accelerated construction activities lately, while at the same time Palestinian residents are being harassed and forbidden from tending their fields which lie near the settlement. Dozens of Israeli settlers and soldiers attacked, Friday, Palestinian farmers working on their lands in the southern West Bank district of Hebron, and in Nablus, in the northern part of the West Bank, several injuries were reported. In Nablus, one woman suffered various cuts and bruises after a group of extremist settlers attacked her and her husband, and hurled stones at them. Local sources reported that the settlers came from the Yitzhar illegal settlement, south of Nablus, and added that the settlers violently attacked Mohammad Rashed Ghazal, 47, and his wife, Hanan Eghbariyya, 43. Hanan was injured in the head and shoulders and was moved to a local hospital. Rashid said that as he and his wife went to their orchard to pick their olive trees in Ein Mikhna area, close to the Huwwara military roadblock, they found out that the settlers were picking their olives; the settlers then attacked them while the army did not intervene. In Ithna town, near Hebron, five Palestinians, including four family members, were injured after Israeli soldiers attacked them as they were picking olive trees in their orchard. Medical sources reported that resident Mohammad Bashir Sleimiyya suffocated after inhaling gas fired by the army at dozens of Palestinians picking olives in Wad Reesha area, at the western entrance of Ithna, west of Hebron. Also, four members of the same family were injured after being violently beaten by Israeli soldiers in the same area. It is worth mentioning that the army installed several roadblocks in the Hebron district, stopped and interrogated dozens of residents. Israeli occupation soldiers attacked , Friday, several Palestinian fishing boats in As-Sudaniyy area and the coastal area west of Gaza City. Local sources said that the attack did not lead to damages or injuries, but the fishermen were forced back to the shore after the army prevented them from fishing. 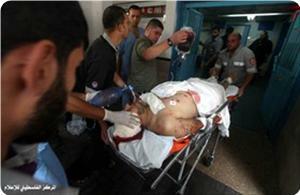 The army also opened fire at fishermen west of Gaza. On October 7, Israeli Naval Forces positioned off Al-Waha resort northwest of Beit Lahia, northern Gaza Strip, and arrested four fishermen while they were fishing 2.5 nautical miles off the shore. The army chased a fisherman Majed Fadel Baker (51), who was sailing with his three sons Imran (27), Fadi (26), and Mohammad Majed Baker (20). Israel carries out repeated attacks against the fishermen in Gaza, and issue that led to several casualties; the army also confiscated several fishing boats. Israel reduced the area of fishing from 20 nautical miles, which was established upon in the agreements signed between Palestinians and Israel, to 6 nautical miles in 2008, but the Israeli navy continued to prevent fishermen from going beyond 3 nautical miles since 2009. As a result, fishermen are prevented from reaching areas beyond that distance where fish is abundant. Sometimes, Israeli forces also chase fishermen within the 3 nautical mile area. Consequently, Palestinian fishermen have lost 85% of their source of income, because of the limiting the fishing area.